For example, you are betting only with TRX and mining AB coin. 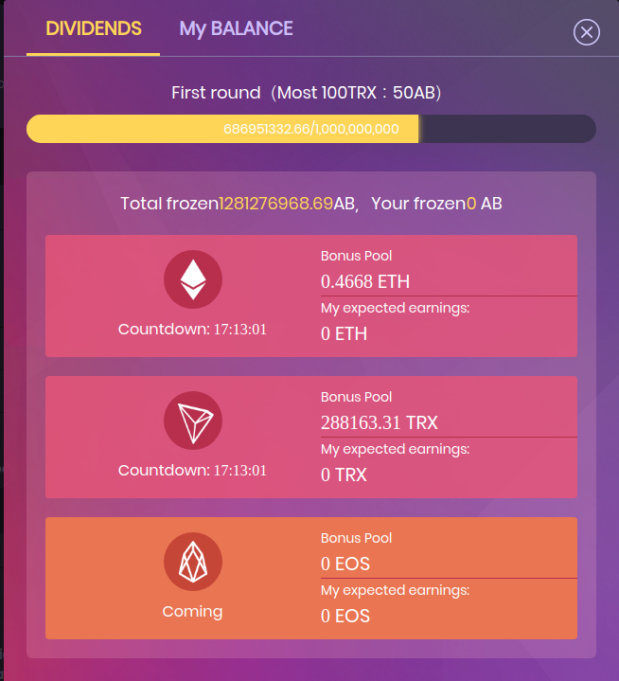 After freezing it, you will receive dividends for all coins that other users played, ETH, TRX and soon EOS. Payment are once in 24 hours and the total amount of AB Token is 10 billion. 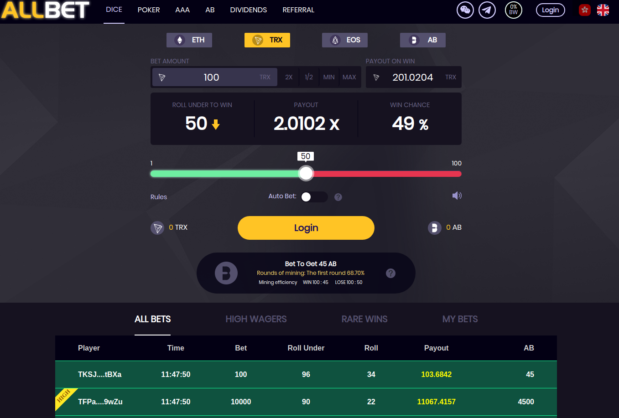 At this time, we are still in FIRST round of mining where you can receive 45 AB tokens for win and 50 AB tokens for lose, if you are betting with 100 TRX. For example, if you are betting with 1 ETH, you will receive 2800 AB for win, or 3200 AB tokens for lose. We have to say that ETH betting bring a slightly better amount of AB tokens, but it is much more slower that mining with TRX. Beside classic DICE game, you can also play POKER with three types of games in one. 1. Figure Bet: You can choose one or less than twelve numbers to bet. If the ‘Lucky Suit’ is the same as the prediction, you can get rewards. 2. Suit Bet: You can choose one or less than three suits to bet. If the ‘Lucky suit’ is the same as the prediction, you can get rewards. 3. Mixed Bet: You can choose numbers and suits at the same time. If you choose 13 numbers, the suits are no more than 3.If you choose 4 suits, the numbers are no more than 12. If the ‘Lucky Mixed bet’ is the same as the prediction, you can get rewards. At this moment, poker game can be played only with TRX. One more important thing. Developers have said that AB token will not be listed on any exchanges, so only way to get them is mining. But, don’t get this for sure. We have many examples from the past that devs “change their minds” and listed coins after some time. 1. You can get a reward of 8% AB token which is mined by your friend when your friend joins in game mining, and your friend can also get a reward of 2% AB token. 2. The reward above comes from the system airdrop. I am sure that there will be a lot of websites with this “multi-platform” concept, but AllBet is the ice-breaker in this field. We will see very soon how it goes. At the moment, dividends pool was over 1 million TRX what is really good result for first few days of website life.